Chicken Divan is a chicken casserole usually served with broccoli, almonds, and Mornay sauce. It was named after the place of its invention, the Divan Parisienne Restaurant in the New York City Chatham Hotel where it was served as the signature dish in the early twentieth century. Its creator, a chef named Lagasi, created it as part of a contest, winning a small amount of money and creating the hotel's signature dish. In French, the word divan refers to a meeting place or great hall, and thus the name was chosen to imply a kind of continental elegance. 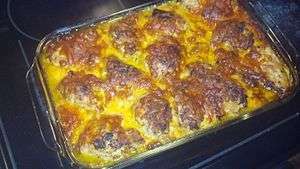 The dish is now commonly prepared with regular Parmesan cheese and remains one of the most classic American casserole dishes today. A "quick" version can be made with pre-cooked chicken breasts, prepared mayonnaise and canned soup. Some versions are topped with potato chips, in a manner similar to that of funeral potatoes. iFood.tv says it "was originally made by the chefs of Divan Parisienne Restaurant of the New York Chatham Hotel. It is considered that the dish was given this name to imply elegance and attract attention of the restaurant's owners. It was a signature dish of the restaurant in the early twentieth century, though the exact chefs who contributed to its making are not known." 1 2 Villas, James (2003). Crazy for Casseroles. The Harvard Common Press. ISBN 978-1-55832-217-2. Retrieved 2008-07-17.